This is how it all went down on Saturday.... 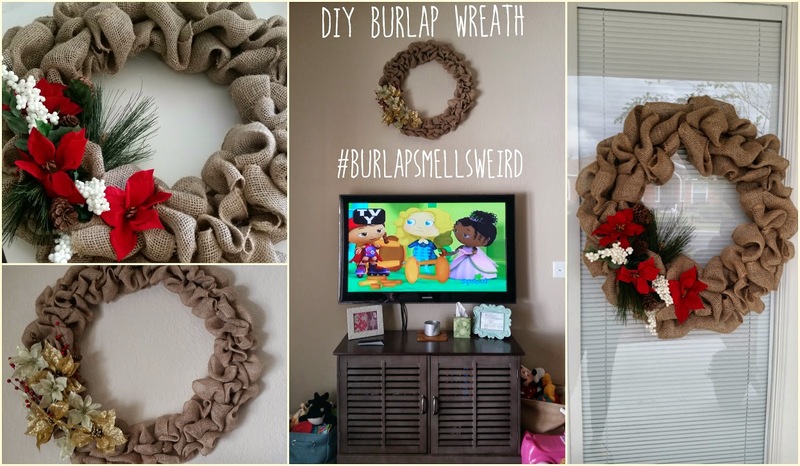 I watched a 2 minute tutorial on how to make a burlap wreath, next thing I know I'm booking it to Joann's for materials. Forty bucks later, I'm back home with the brilliant plan to make not one, but TWO wreaths. In the time it took for me to watch Christmas Vacation I was able to complete one large wreath for inside above my media console and another regular sized (?) one for our front door. I'm not going to even try to call this a tutorial. There isn't much to explain, I wasn't joking when I said it was just a two minute video that explains all you need to know. I used an 18-inch and a 24-inch wire wreath frame, which took 3 roles of burlap (I believe each role had 10 yards). The flowers are just weaved into the wire frame. I was going to attempt some hot glue gun action, but I'm glad I left well enough alone. The plan is to maybe swap the flowers out and recycle these wreaths for another holiday or maybe just turn them into something "everyday". I'm going burlap crazy up in here. Fun fact, burlap does in fact smell weird....it also makes a mess so lay out a blanket and don't wear your good leggings! Use the hashtag #burlapsmellsweird if you make one so I can see! Let me know if you have questions, I feel like I'm not being specific enough! So cute! I love the gold flowers. Super, super, super adorable! I may have to do this next year! Pinning it! I am just astonished to see just how good of an article this is. This is a very nice blog that I will definitively come back to more times this year! God knows exactly what's going on. He is our Rock!